As a creature of habit, I find myself in Thailand once again. I have lost count on how many times I’ve been here since the late 90’s (some years two or three times), but why go somewhere else when you’ve found the perfect spot? I even stay at the same hotel most of the times, so it’s almost like a home away from home to me. What? 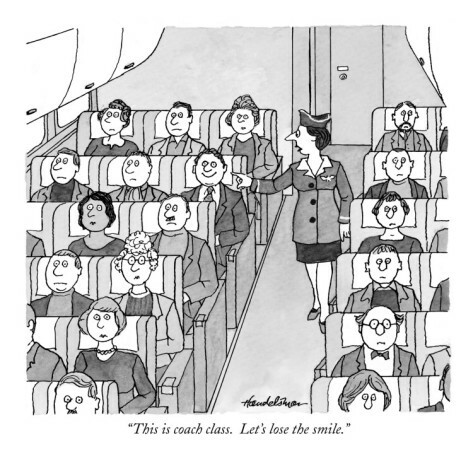 No fun in coach? This trip is slightly different though. I’m traveling with my old buddyÂ Masse this time (I usually go alone), and since he is as poor as a church mouse, I’ve had to make some sacrifices. 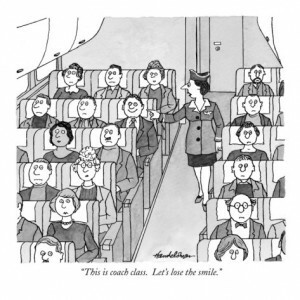 It’s been years since I got fed up with travelling coach, so now I only fly Premium or Business Class. It’s expensive, but when you spend 11+12 hours (it’s always an hour more on the way back since we’re flying against the trade winds then) on the plane, it’s worth it if you can afford it. Now I had to ride coach though :O Well, I didn’t strictly speaking have to, but I wanted to sit with Masse. 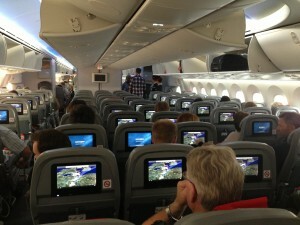 It was alright though since we flew with a brand new Boeing Dreamliner which is rather comfortable even in coach. 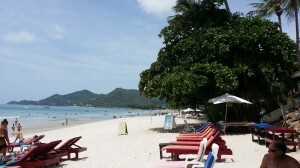 At our destination, Koh Samui, I always stay at Aloha Resort on Lamai Beach. I chose Lamai over Chaweng Beach since the latter is too crowded for my taste. 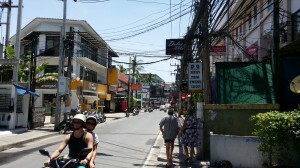 Masse is more of an action man than me though, so this time I’m on Chaweng. We took the bus from LinkÃ¶ping to Stockholm, and then Arlanda Express to Arlanda airport. The bus was a good choice since the trains were delayed (as they so often are). 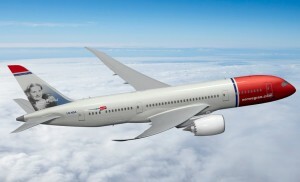 We flew with Norwegian from Arlanda to Bangkok. The plane was a new Boeing Dreamliner (a 787-8 to be precise). You may have noticed that there have been, and still are, lots of problems with the Dreamliners. We got lucky though. The day before we left I checked all Norwegian flights with the 787 for the last couple of days, and they were all delayed. The flight with the least delay lifted one hour after plan! The flight lasted eleven hours. Masse dosed off a couple of times, but I wasn’t tired at all and stayed awake the whole time. Flying economy class with Norwegian means that absolutely nothing is included except for the seat. You have to use a credit card to pay with if you want food, water, drinks, a blanket, headphones, and anything else you might need. But at least they have made it easy to order and pay. You just select the “shop” from the touchscreen in front of your nose, pick out what you want, swipe your credit card in the slot, and within moments a flight attendant comes along with your stuff. We landed in Bangkok about 35 minutes late at 7:30 am, so I had 90 minutes before my Bangkok Airways flight to Koh Samui took off (Masse stayed in Bangkok for a couple of nights). I had already checked in over Internet, and I don’t have any baggage to check, so all I needed to do was to show up at the gate 40 minutes before boarding. Easy, right? Nope. After getting off the plane I had to walk a kilometer or so to the main building, wait in line at Immigration, get through Customs, and climb the escalator to Departures on the 4th floor. When I made it there I realized that my phone wouldn’t connect to any network (roaming didn’t work), so I couldn’t get at the email with my electronic boarding card. Great! What to do now? The lines at the check-in counters were huge, and by the looks of the passengers waiting there, I would have been lynched if I had tried to cut in. The check-in machines (correctly) noted that I had already checked in and refused to let me do it again. I remembered that I had my old Thai SIM card in the wallet and tried to use it, but it was dead (probably disconnected since I hadn’t used it for so long). Anyway, I bought a new TrueMove-H “3G Tourist Inter SIM” package with 30 days (cheaper than 2*7 days) Internet over 3G (up to 6 GB data). It works great, and TrueMove also have WiFi hot-spots everywhere, and they are free when you have that package. 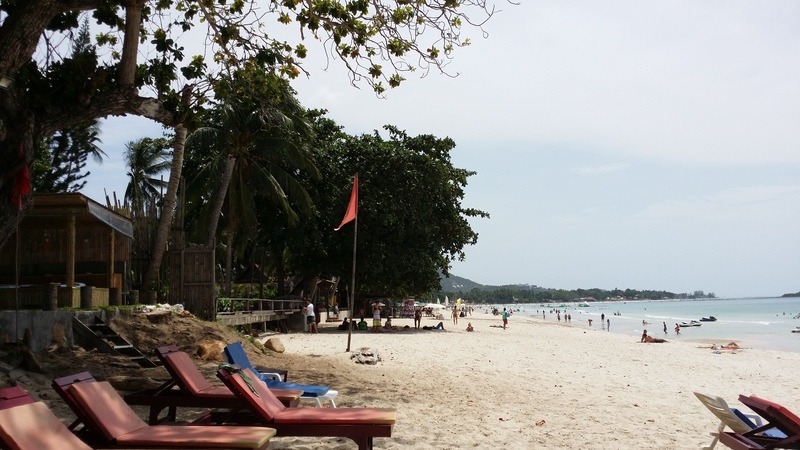 The flight was delayed 30 minutes, and it was a smaller, slower propeller plane, but I landed on Koh Samui around noon without further problems. The hotel was then just a ten minute taxi ride away. I had found a really nice bungalow village by the beach in the southern, less crowded, part of the beach. 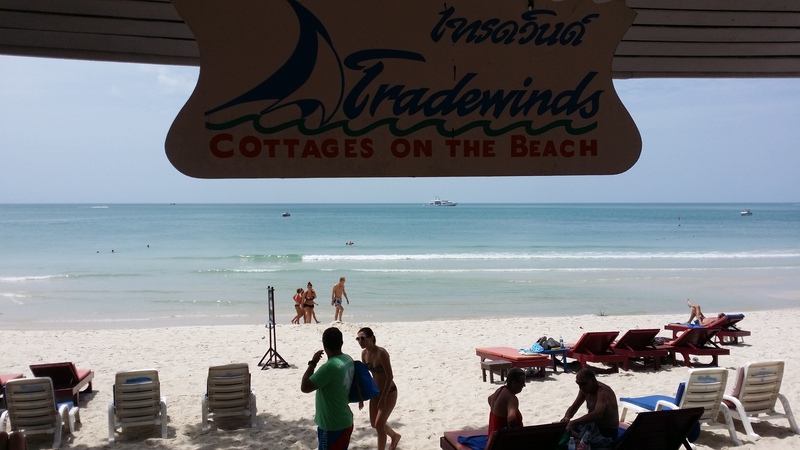 The full name of the “hotel” is Tradewinds by LAWANA, but here it’s known as just Tradewinds. I have a “garden view” bungalow, but I can still see part of the pool, and beyond it the sea, from my porch. 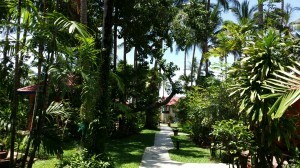 …and inside the gates looking east down the path to my bungalow and the sea. Not my bungalow, but they are identical. 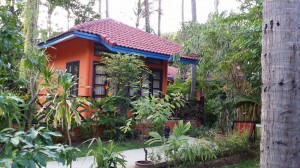 The bungalows are quite big, and orange with blue splines and red tile roofs. The porches are also big with stone tile floor and wooden furniture (I don’t like the plastic stuff that is so common down here). I couldn’t get a good picture of my own bungalow since it is surrounded by that green stuff, but there is a picture of the one next to mine somewhere on this page. There’s no minibar, but a large fridge that I fill with drinks and snacks from the store across the street. And my snus for the trip of course. Last night I woke up from a scratching sound by the window. It turned out to be two Gecko lizards playing around. I like those little creatures, and they eat mosquitoes and other annoying insects, so I let them be and went back to sleep. Sunrise is at 6:10 am, so I get up at six, sit on the porch until seven when breakfast is served in the beach-side restaurant 15 meters away. After breakfast I go for a swim in the sea, and then it’s back to the porch again. It’s about an hour to sunset now (happens at 6:43 pm) and the mosquitoes are beginning to get aggressive. There are lots of places for them to breed here in the garden, which I guess is pretty much the only negative thing about staying here instead of at a “real” hotel. Ok, one final picture from the beach and that’s it for now.